Ravindra Jadeja has taken part in 14 T20s and has taken just seven wickets at a dismal average of 47.28 runs per wicket with the best of 2-26. The decision of inducting him bounced back since he was punished for 29 runs in 2.4 overs at an economy rate of 10.87. Earlier, Mohammad Hafeez won the toss for Pakistan and invited India to bat first on a track which looked like assisting the fast bowlers. The visitors brought in a lanky fast bowler, Mohammad Irfan, who made his debut in T20, opened the attack and was quite impressive in his entire spell. He had the support of the two other quickies, Sohail Tanvir and Umar Gul, who also did well to contain the rival batting. Gautam Gambhir and Ajinkya Rahane provided a solid start for the hosts by associating a solid 77 runs partnership off 10.5 overs. Gambhir and Rahane were the top scorers with 43 and 42 runs respectively as the middle order crumbled. The Men in Green came back in the game by penetrating through the solid middle order of the Blue Shirts who were restricted to 133 after 20 overs. The entire Chinnaswammy Stadium erupted when the young gun of India, Bhuvneshwar Kumar, sent the top order batting of Pakistan reeling at 3-12 while claiming all three wickets. The youngster clean bowled Nasir Jamshed and Umar Akmal for 2 and 0 runs respectively and Ahmed Shehzad was smartly caught behind by Dhoni for just 5 runs. Kumar was well assisted by the fast bowling duo of Ashok Dinda and Ishant Sharma who kept the pressure on the Green Shirt batsmen. The experienced Shoaib Malik and Mohammad Hafeez negotiated the initial burst of lethal pace bowling and scored against the weak spin unit of India. The trio of Virat Kohli, Yuvraj Singh and Ravindra Jadeja were hammered all around the park and they gave away 75 runs in 7.4 overs. The fourth wicket partnership consolidated the innings while enhancing the score to 118 before Mohammad Hafeez lost his wicket for 61 runs. Pakistan still needed 10 runs from the last over to win the match as India had burnt the quota of their all three quickies and Dhoni was left with no other option but to hand over the ball to Jadeja. 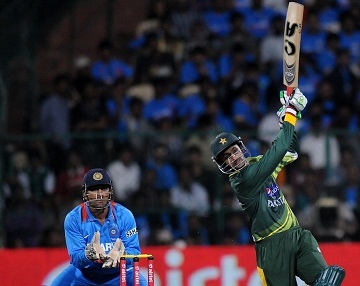 Shoaib Malik dispatched the ball flying over the bowler’s head towards the sightscreen for a six. He occupied the crease for 57 runs as Pakistan won the match on the fourth ball of the final over with a margin of five wickets. Ravichandran Ashwin has taken part in 17 T20s and has claimed 13 wickets at an average of 38.61 runs per wicket with the best of 2-16. He appeared in both T20 games against the visiting England cricket team but remained unimpressive. The off spinner registered 4-1-33-1 in the first match at Pune, on December 20, 2012, followed by 4-0-38-0 in the second match which was played on December 22, 2012, at Wankhede Stadium, Mumbai. 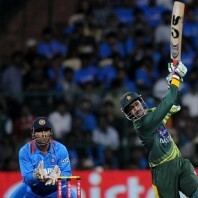 The two match T20 series against the visitors ended in 1-1 draw. Mohammad Hafeez, on the other hand was pleased not facing Ravichandran Ashwin and felt that a lot of pressure was released once they knew that the star off spinner was not in the squad.